MSC is committed to the best interests of the players and high quality soccer in an atmosphere that stresses teamwork, sportsmanship, and skilled soccer play that will help players gain a life-long love and appreciation for soccer. Welcome to MSC′s home on the web! Welcome to the Moorestown Soccer Club (MSC) website, located in Moorestown, NJ. MSC provides opportunities to girls and boys, from ages 8 through 19, to enjoy the sport of soccer at both competitive and recreational levels. MSC sends two teams to the finals of the SJ Cup!! The Moorestown Soccer Club is proud to announce that two teams have advanced to the 2019 Finals of the South Jersey Cup! The SJ Cup hosts hundreds of teams over the course of the Fall and Spring seasons, and plays in group and knockout stages leading up to the Spring final. The Girls 2007 Fury, coached by Jim Blong and Keith Omlor, played a tough TBAA team in Marlton this past weekend. TBAA and the Fury have been top flight teams over the past couple of years, and have had a lot of head to head matchups in the past. The Fury fought hard and pulled out an incredible 3-0 victory. They will the Marlton Devils in the final in mid-May. The Boys 2008 Rapids, coached by Jason Arroyo, Samir Shah, and Erin Finazzo, traveled down to TBAA in Blackwood to face Atlantic United. Both teams played a tough game, with our Rapids pulling out a 3-1 win. The boys will play Penns Grove in the final in mid-May. Congratulations to both the Fury and Rapids, and good luck in the final!! Applications now being accepted for the MSC Scholarship! All Moorestown Soccer Club (MSC) players and former players who will graduate from high school this June, and attend college in the fall of 2019 are eligible to apply to the annual Moorestown Soccer Club – Nicole Zimalong Memorial Scholarship. The number of scholarships and amount (no less than $500) given out each year will be at the discretion of the MSC Board of Directors based upon the quality of the applications and the financial constraints of MSC. Deadline to submit application is May 5, 2019. Any questions can be directed to Cheryl Roberts at cherylroberts@comcast.net. MSC Announces Premier Sponsorship with Cooper for 2019/2020! 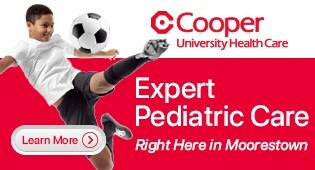 The Moorestown Soccer Club is proud to announce Cooper University Health Care as the premier sponsor for 2019 and 2020. In alignment with one of our club’s key principles of providing a safe soccer environment, we are excited about this new relationship with Cooper, a resource for health and wellness. Cooper will be our primary jersey sponsor through the Spring 2021 season. Cooper is the leading, tertiary academic health system in South Jersey and is a resource for every member of your family – from the youngest to the most senior member. Cooper is the only state-designated Level 1 Trauma Center in South Jersey, and has more than 630 physicians in more than 75 medical specialties, a network of more than 100 medical offices, and an ambulatory Surgical Center in Voorhees. Locally, Cooper has four regional urgent care centers, including one on Route 130 in nearby Cinnaminson. Cooper University Health Care is more than just a name on a jersey. Cooper is there to be our club’s partner in health. We encourage you to learn more about Cooper University Health Care by visiting their website.